Kyubit Analytic Model is a Self-Service BI analytic feature that is quickly created using your data from SQL query results and CSV files. 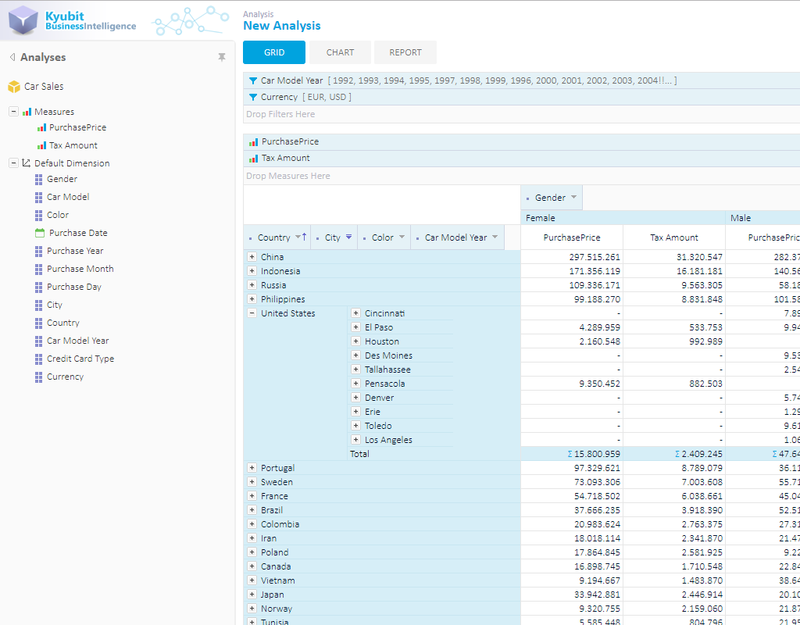 With 'Analytic Models', end-user can create analytics, reports, visualizations, and dashboards, using measures, dimensions, slicers and many features similar to OLAP analysis. In many occasions you have a set of data you wish to analyze, visualize, find additional answers and insights, but you probably will not engage creating Datawarehouse/OLAP cubes, which almost always requires knowledge, time, tools, etc. 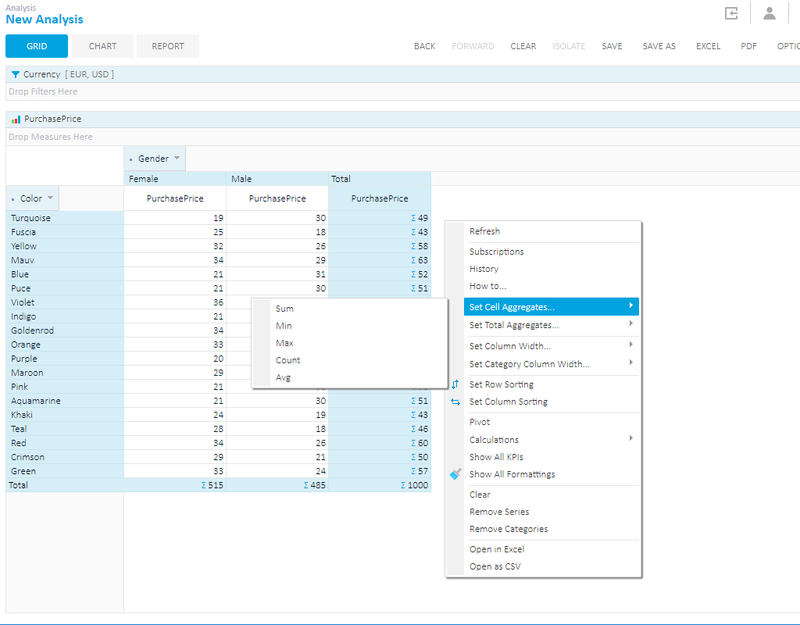 With Kyubit Self-Service BI tools, end-user can quickly import data from SQL query results and CSV files and configure Analytic Models, which multidimensional analytic behavior is very similar to OLAP cube analysis. A set of values from SQL query results or CSV files is transformed to analytic models and Self-Service BI tools are ready for all Kyubit users to use them in the analysis, reports, and dashboards, while values from the same data sources could be scheduled to be updated regularly with new values based on our scheduled update preference. Once Self-Service data model (Analytic Model) is created in Kyubit BI application, the same user, as well as other authorized users, can quickly create data analysis, charts, and reports based on the same Analytic Model with the simple and comprehensive approach (drag-and-drop) that does not require special skills or training. 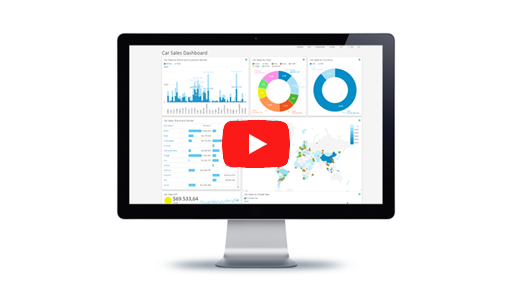 Furthermore, created analysis/report could be used while creating dashboard charts, tables, and KPIs, to visualize prepared data insights by the regular end-user. 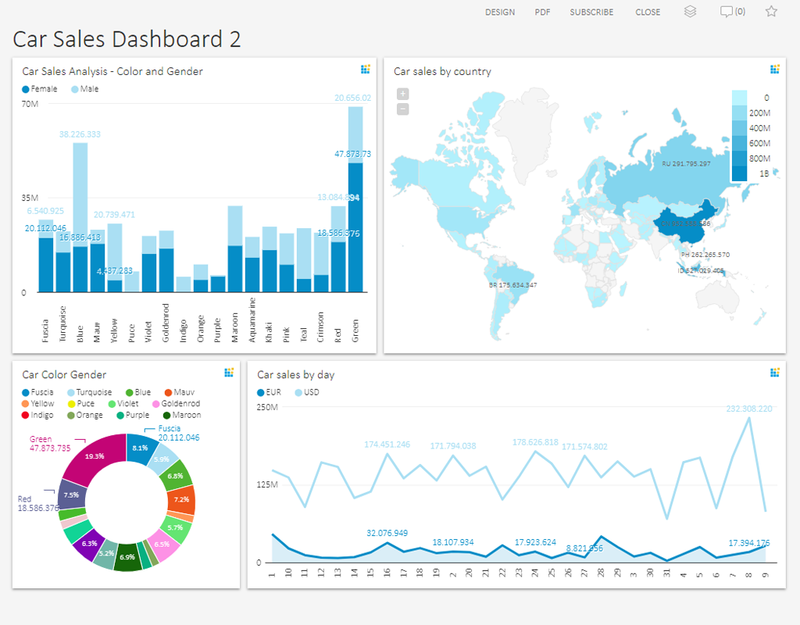 Kyubit BI includes features to quickly design dashboard layout by drag-and-drop various charts, connecting with previously prepared queries or analyses, positioning and resizing dashboard elements, setting display options for individual dashboard element and setting overall dashboard style. 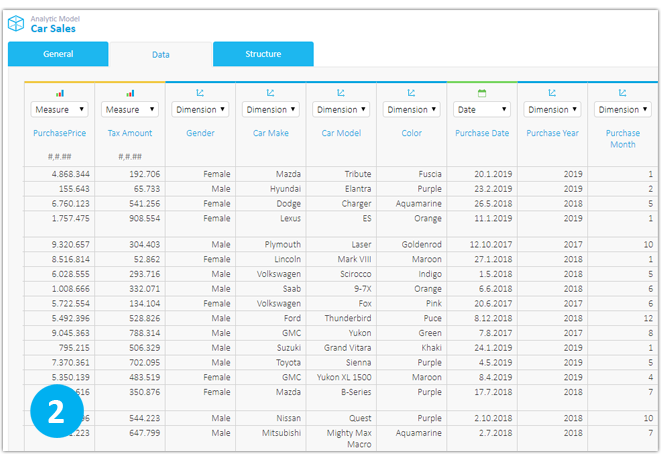 After Kyubit Self-Service BI 'Analytic Model' is processed, authorized end-users can start the analysis, that will look almost the same as if they are analyzing OLAP cube structures (very similar). 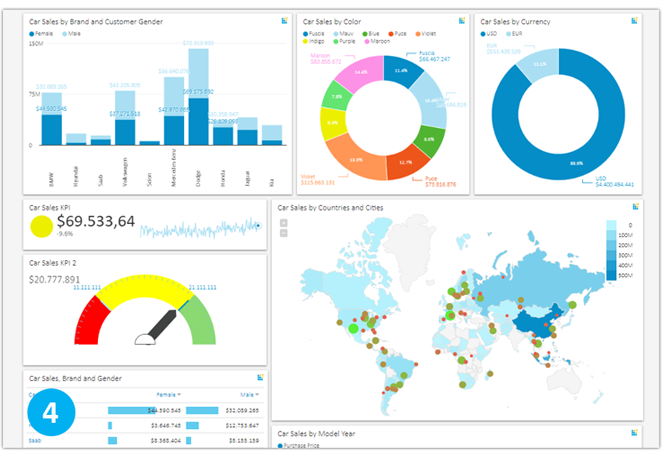 End-users can create analysis, reports and create dashboards based on created analysis the same way they are doing with OLAP based analyses. Most features, like drill-down, drill-through, expanding, slicing, ordering, isolating are included in the Analytic model analysis. After you import your data from CSV files or SQL query Results and process 'Analytic Model', Kyubit creates special structures in Kyubit internal "KyubitAnalyticModels" database, that are suitable for quick analytic SQL queries. While analyzing data Kyubit is creating SQL queries to bring analytic results from Kyubit Analytic Models database. In other words, Kyubit is using SQL technology, combined with ColumnStore indexes and some smart caching to bring data analysis. Only technology prerequisite is MS SQL Server, which is prerequisite for the whole product anyway. 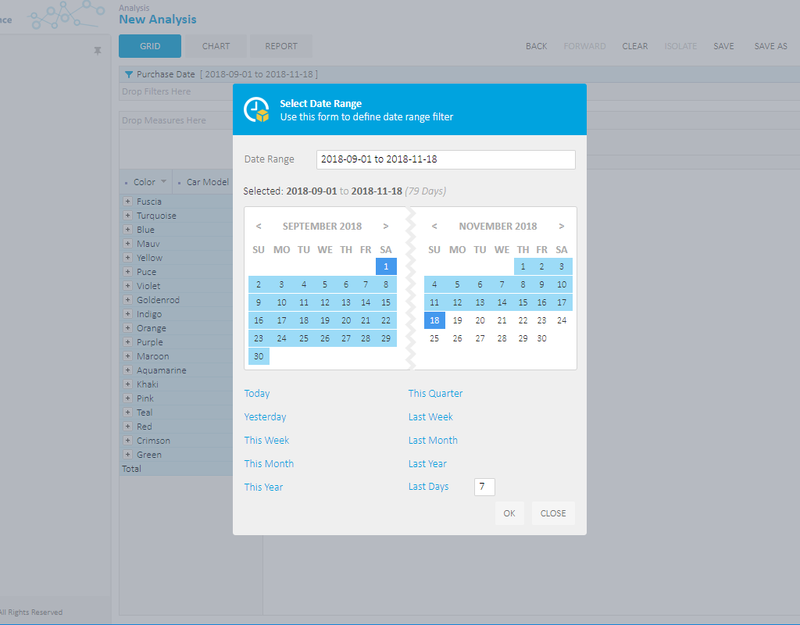 The main reason to use 'Analytic Model' is for a regular user to quickly add a set of data for analysis, dashboard usage, scheduled subscriptions and sharing with other users. 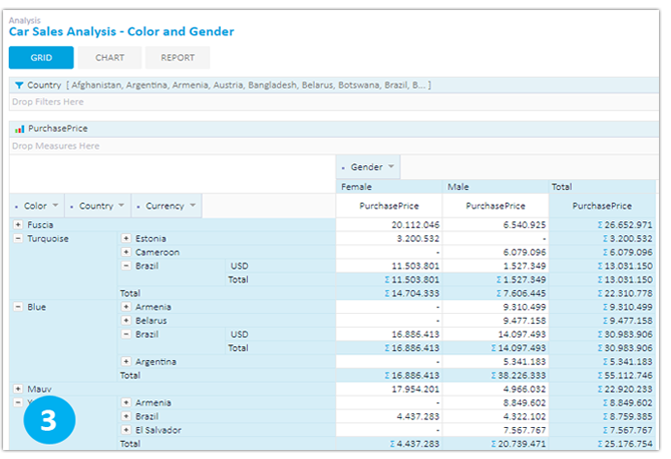 CSV data format should be friendly to all users while preparing data to be used. Any set of data could be exported from Excel to CSV file (semicolon (;) delimited). 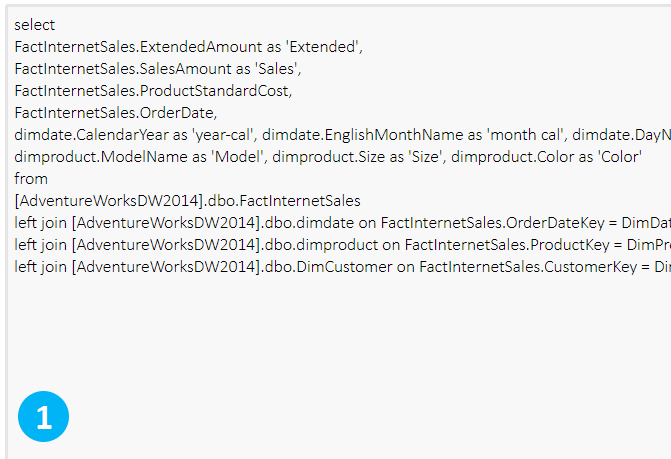 Great usage of Date filters (if data contains date values) that are much friendlier to be used than OLAP ‘date’ structures. Quickly select absolute or relative date filter values in the analysis, report or dashboard filters. There are limitations to Kyubit Self-Service BI 'Analytic Model' usage, that should be known before using new Kyubit technology. Kyubit Analytic Model is not created in mind to replace more serious analytic engines, like OLAP technology, but to bring a simple solution for smaller data sets that should be analyzed quickly with very little knowledge of data analysis and structures. 'Analytic Model' will perform great with hundreds of thousands of rows of data, even a couple of millions, while we would not recommend being used with tens of millions of rows of data. This question also greatly depends on the hardware on which the SQL server is running. There are no limitations to the number of category members (rows) in grid analysis and reports, while analytic grid and report can contain a maximum of 128 series (columns) of values in the analysis for each measure in the analysis. 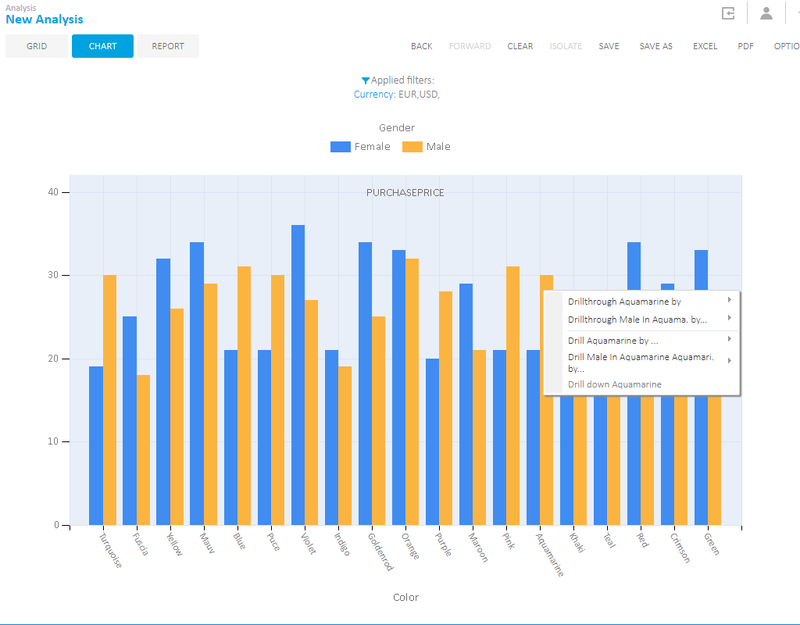 On category axis, there could be multiple category levels expanding (drill-down) to explore data in more details, while series members cannot be expanded.